Experience historic Randolph County from the comfort of this charming Chester, Illinois hotel, just minutes from Fort DeChartres, Pierre Menard's home and Fort Kaskaskia. Located on a bluff overlooking the Mississippi River, the Best Western Chester Hotel offers guests the perfect home away from home while they experience all that the area has to offer. History lovers delight in the many well-known historical attractions, such as Fort DeChartres, the Popeye Statue River Outlook, the Cohen Mansion and author Pierre Menard's home. This Chester hotel is also close to Cole Memorial Park and the Elias Kent Museum. Within an hour's drive of Chester, guests can visit Fairmount Park, Gateway International Raceway and Six Flags Over Mid-America in nearby St. Louis. This Chester hotel is a favorite among travelers who are attending one of the areas many music festivals and annual events, such as the Prairie DuRocher Rendezvous, the Grand American or shooting events at the World Shooting Complex in Sparta, IL. This Chester hotel is also a great choice for Popeye fans, the beloved cartoon character originated here and the town is host to the annual Popeye Picnic each fall. Business travelers appreciate that the Best Western Chester Hotel is close to many area businesses, such as the Menard Correctional Center, the Chester Mental Health Center, the Gilster Mary Lee Corporation and the Union Pacific Railroad. This Chester hotel is also just 60 miles from St. Louis. 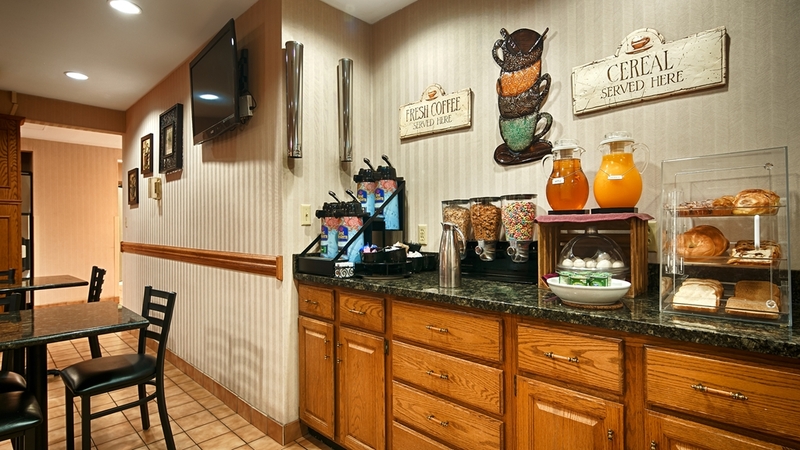 The Best Western Chester Hotel offers 46 spacious guest rooms featuring a work desk, microwave, refrigerator, cable TV with HBO and Wi-Fi access. Our guests are invited to take a dip in our sparkling outdoor pool. For added convenience, Reid's Harvest House Restaurant is nearby and offers a discount for guests staying at this Chester Best Western. For a comfortable stay at an affordable price, make your reservation at the Best Western Chester Hotel! From: All directions. Take Illinois Route 150 East. Chester is two miles east of Illinois Route 3, 18 miles east of Exit 129 on Interstate 55 at Perryville, Missouri via Chester Mississippi River Bridge. The Best Western Chester Hotel is located nine miles west of Illinois Route 4 on Route 150.